Despite two feet of rainfall, almost 300,000 first-responder calls and hundreds of water rescues during last month’s historic South Carolina flood, the Charleston County Sheriff’s Department radio communications sustained virtually uninterrupted service due to proper preparation and its P25 radio network, according to a county official. From the time the county had its first signs of rainfall on Friday, Oct. 2, until Tuesday, Oct. 6, Charleston County’s ASTRO 25 radio network from Motorola Solutions received 275,000 first-responders calls, and only nine calls received a busy signal, Bill Tunick, director of radio and telecom for the county, said during an interview with IWCE’s Urgent Communications. The always-on, IP-based P25 network had the greatest coverage risks in Charleston’s 1,000 square-mile coastal area, where hundreds of rescues took place. “We neared 100% call success rate,” Tunick said. “We had tons of water rescues, both in the flash-flood event, when the rain was coming down, and post-rain. We had some severe river flooding, because some of our rivers are in really rural areas of Charleston County. Charleston County was one of the early adopters of interoperable communications systems after the county experienced the vulnerabilities of its analog system when Hurricane Hugo in 1989, Tunick said. The system was updated in 1991, and the P25 system was implemented in 2006. The radio network was key, but the county also had to erect hurricane and flood-ready infrastructure, including 16 towers across the county. Planning also contributed to the successful rescue efforts and seamless communications with neighboring jurisdictions, including the state and national Coast Guard, as well as the statewide Palmetto 800 MHz radio and data system—most of which do not use P25 technology, said Robert Marshall, territory vice president of sales for Motorola Solutions. 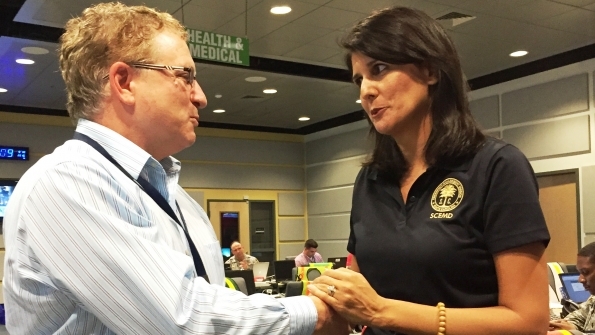 A day before the storm began, Motorola’s engineering and sales team conferenced with state and Charleston County officials to ensure that all were prepared for the onslaught of calls and rescues that would ensue. During that process, Motorola discovered that the state’s public-safety communications’ team had depleted its cache of radios, so 100 APX Series P25 two-way radios were ordered and delivered within 24 hours.